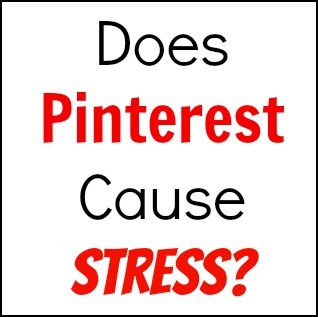 Does Pinterest Cause You Stress? A recent article in the Huffington Post Pinterest Stress: Close To Half Of Mothers Stressed By Social Media Site, Survey Finds discusses the stress and anxiety that women are feeling as a result of the idealized images seen on Pinterest. The article states "Pinterest culture can generate feelings of inadequacy by creating a pressure to throw elaborate birthday parties, attempt intimidating DIYs and bake picture-perfect cupcakes." However, I don't think it's the women who are feeling stress from Pinterest. I think it's the men. If you are a pin junkie, the man in your life is undoubtedly going to be affected by your Pinterest addiction and may suffer some stress because of it. I can't tell you how many times I've called my husband to stop at the store to pick up something I needed for a project. He's been subjected to strange foods (read vegetables) like vegetarian lasagna and zucchini and onion pie for dinner. His concern and alarm were evident when he saw that I'd glued fabric to our closet doors. Is that PERMANENT! The author of Pinterest Stress Not Just For Moms asserts that much of men's Pinterest stress comes from men having to help with Pinterest projects. "Certain Pinterest projects require some assistance from the member of the household with a little more experience with various power tools, epoxies, and soldering." I'm sure there are women who are handy with power tools, epoxies, and soldering, but I'm not one of them and I certainty needed my husband's help with the laundry room makeover. I can honestly say that Pinterest doesn't cause me stress. I like Pinterest because I think it motivates me try new things. I've tried crafts, home improvement projects, and new recipes. They don't always turn out well. My attempts at making blueberry breakfast cake, a dirty girl scout, and slow cooker swiss chicken are some great examples. Most of the time, the projects I've tried have been successful and I've been very pleased with the results. When my attempts at Pinterest projects don't turn out well, I've had a good laugh. As with most things in life, you need to have some perspective. This is something my mom always told me and I think it's good advice. Each person is different with different strengths and talents. No one is perfect. You're bound to make mistakes at some point. Enjoy it and have a good laugh, even if that means sometimes you might be laughing at yourself. Pinterest is supposed to be fun and that's how I view it. I'm sure there are some men who wish Pinterest had never been created because they now spend more time than they'd like helping their wives with Pinterest projects! I have a lot of fun with Pinterest because I've tried many new things and have learned some new things in the process. Do social media sites like Pinterest cause stress because of pressure to be perfect? Does Pinterest cause your husband stress? You're right - it is time monopolizer! I like Pinterest for de-stressing as well. I wish I was addicted, I don't even get it! I mean, Pinterest...I pin some things cause they suggest I do, but than I never remember to do so. I still don't find the use for it, actually. I wish I did though. Very interesting, your post helped me to understand it some. Thanks! Pinterest doesn't stress me at all. I do look at it and pin something almost every day. It's the equivalent of looking at magazine page and tearing them out. I may or may not ever look at them again. If Pinterest makes a person feel inadequate...then maybe they were likely to feel that way anyway. I think it's relaxing too! I used to read, but now Pinterest is what I do to unwind after work. I like that Pinterest is a positive place. Other social media sites have become so 'everyday' where people post or argue every thought in their head...that's more stressful for me. So instead I peruse Pinterest!!! Sometimes for hours...sometimes not at all. I have tried and tested several recipes and they worked out wonderfully...also I pin clothes that I have my eye on, or ones I would/could never wear, but look so pretty...It's also confirmed that everyting I like is pastel, or has lace. You can see my pins here: http://pinterest.com/kiki_nakita/pins/ ...You definitely have me beat with pins. I'll be sure to follow along. It's all good! I thing Pinterest has probably inspired several blogs! I can see how Pinterest could be stressful to those women who aren't crafty. My best friend in the world is very much not into crafting of any sort, but she always feels like she's being compared to everything on Pinterest. I see it as a way of finding inspiration--but that's just me. My husband, luckily, is also addicted (but shhhh, don't tell--he's embarrassed about it), so it makes for a lot of fun DIY projects that we get to do together! How cool to have a husband who likes Pinterest! Great topic! My friends and I were just debating this the other day. My friend who disagreed saw it as a point for comparison, so it was very overwhelming and depressing for her. I agree whole-heartedly with you that if it's being used as a fun tool to gather ideas and learn new things, then it's fabulous! The right frame of mind goes a long way! Pinterest has its good and bad for sure. It definitely eats time but it provides ispiration for all kinds of things you are interested in. If it stresses someone out, then they should spend their time elsewhere. I prefer Pinterest to Facebook. At least I feel it is productive where FB is not in most cases. Yes maybe the photos on Pinterest are overly perfect but it gives me something to strive for. Pinterest has caused me to add to my 'collection' of stuff which isn't a positive but it has also given me hundreds of ideas to use the things in my stash and create many things I'd never have come up with on my own. It's really no different than paging through magazines and tearing out things you want to do except now it's all kept digitally on your computer instead of piles of file folder. I love Pinterest. I completely agree with you. Pinterest can take up a lot of time and you have to set some limits, otherwise you can get lost there for hours (or days!) I've even gone as far as setting a timer to keep myself from spending too much time on Pinterest. I also like the point you bring up about storing all your good ideas digitally instead of ripping out pages from magazines. That's one of the things I like about Pinterest too. I found that when I did tear out pages from magazines, I would never go back to them, but with Pinterest, I do go back to the things that I pin. Agreed, agreed, agreed. Social media can be great, but it sure can be negative too! I'm not sure that Pinterest causes me stress - I've gone days without getting on... But blogging or other social media outlets take time - and that can cause stress when I've spent too much time on them and it's all of a sudden dinner time! =) Anyway... Thanks for linking up with us at the Pinterest Power Party! Yes, you certainly can spend a lot of time on social media sites. If I'm not careful, what seems like a few minutes can quickly turn into hours! It took quite a long time to convince me to do Pinterest. I now just pin when I am visiting a blog and see something I like or want to try. I never just get on Pinterest and spend hours like so many do. It's sure handy to have a new recipe right at your finger tips. Thanks for sharing with SYC. I agree - Pinterest is a great resource for new recipes! I was totally addicted for a long time but learnt that I needed to set time limits of I would be pinning away all day and night! It definitely caused my hubby way more stress than me. Fun post-thanks for sharing it! The only stress I feel is not using it enough! Sounds like we're both pin junkies Diana! Pinterest is my stress reliever! It somehow helps me bring back to my normal self again most especially after a tiring and bsuy day at school! Happy to meet another pin junkie!